Grocery shopping is one of those necessary expenses that always ends up costing way more than we plan for. From the number of people we have to feed, to how far in advance we need to stock up and the specific items we're shopping for, our bills can often become double what we had anticipated. Thankfully, there are ways you can grocery shop and get your bill down without ever having to pull out a coupon. Even if you don't think you need a bulk amount of an item, you can always find a way to use it, especially if it's a dry good or item you can store for a long time. It'll save you down the road. You may have to jot down the prices you pay for certain items a few times before you can gauge the maximum price you should pay every time you shop for that item.Eventually, you'll commit it to memory. Certain grocery stores will price match or honor deals from other grocery stores, while some might have certain designated deals on different items on certain days of the week. Research before you shop. For dry goods and condiments, stick to generic brand. For products like meat and dairy, stick to a brand you trust. It's almost always more expensive than buying bulk ingredients and using them to prepare on your own. "How did eight boxes of fruit snacks get into the cart?" It will cost you the price of the meat plus the cost of preparation. Buy with bone-in and prep the meat yourself. Especially if they're items like meat or bread, which can be frozen and stored for quite a while. Instead of planning out your meals for the week and shopping for the appropriate ingredients, figure out when certain items go on sale, buy them and plan your meals around those ingredients. It's possible, for example, that buying two boxes of 10 granola bars is cheaper than buying one box of 20, based on the price per unit. Grocery stores tend to stock their most expensive items at eye-level. Look at the top and bottom rows for cheaper items. Your best bet for these kinds of items is drugstores. You may have to readjust your timing on purchasing certain items or switch from buying on a needs basis to shopping in bulk, but the amount of money you'll end up saving up will be seriously sweet. Plus, you can use that extra cash you tuck away to treat yourself to a gourmet meal, one where someone else shops for the ingredients, of course! Set up your finances so that money is taken straight from your paycheck and deposited directly into your savings account or a retirement savings account. You can also set up your fixed bills like your Internet and cable to be automatically deducted from your checking account. Automate your finances to save time and prevent overspending. If you see extra money in your account, chances are you’ll find a way to spend it, leaving you little to invest in your future. Automation helps keep your priorities in line so that as money comes in, it is dispersed to your other accounts immediately. At least twice a year, look at your expenses line by line and see if you’re getting the most bang for your buck. For example, do you read the magazines you subscribe to or maximize that gym membership? If the answer is “no,” consider canceling or negotiating a better rate. Take that money you save, and apply it toward bigger payoffs like debt reduction, retirement or an emergency fund. Lots of people use debit cards to make it easy to buy and budget for groceries, gas and other routine purchases. Instead of doing that, look into a credit card with a great rewards program for those daily purchases, and set it up to automatically pay the statement balance from your checking account each month. Over the course of the year, you could potentially pocket a few extra hundred dollars just by using a card with a good rewards program instead of your ordinary debit card (just make sure you’re paying off your credit card every month, so you don’t pay extra in interest). If you love your job and want to grow your career, it's time to think about boosting your income as well. Make it a goal to negotiate a raise this year. Consider your strengths and look at the value you've provided to your company over the last six months to a year, and discuss it during a performance review. This can feel intimidating, but it never hurts to ask. Take advantage of your skills, or turn a hobby into profit. Doing so can help you generate extra income – which you can put toward reaching your financial goals. Etsy, for example, is a great place to sell one-of-a-kind products. If you have Web design, copy editing or other creative skills, consider offering your services on freelance websites such as Fiverr or Elance. These types of side gigs will allow you to earn extra income while also growing your skills. You can’t save money if you don't know where your money is going. Every month, track your net worth using a personal finance tool or app that will show you exactly where your money is going. This will make you think about your entire financial picture from income and expenses to investments and taxes. With this focus, you can ultimately make the greatest impact on your finances in 2015. 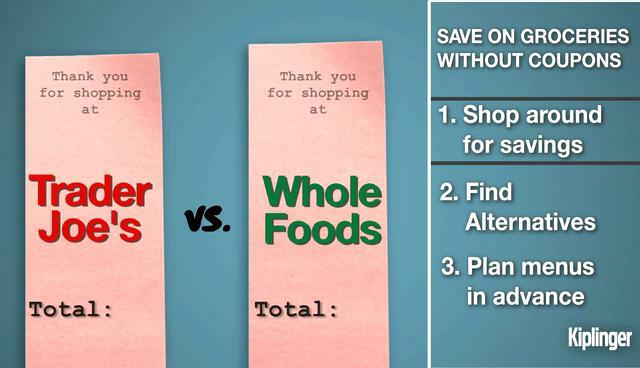 Cheapest place to buy organic: Walmart, Kroger, or Aldi?